Larger ships will use their tenders to bring the passengers ashore. Often referred to as the 'Land below the wind' because it lies below the typhoon belt, Sabah occupies the eastern part of North Borneo and is East Malaysia's second largest state with an area of 74,500 sq km. Sabah has the South China Sea on the west and the Sulu and Celebes Seas on the east. Mountainous and largely carpeted by lush tropical rain forests, its population of nearly two million is made up of 32 colorful ethnic communities. Kota Kinabalu, the capital, lies in a fertile lowland plain where most commercial and administrative activities are concentrated. However, the 'real' Sabah can best be found in its countryside. Kinabalu Park has been listed as a UNESCO Heritage Site, due to the diversity of plant life and wildlife. It provides a challenging climb amidst a lush virgin rain forest, where one can find hidden hot springs in cool altitudes. Sipadan Island off the south eastern coast of Sabah, has been one of the top five dive sites in the world for years. This is attributed to its unique underwater geography that encourages proliferation of wildlife. Leatherback turtles, barracuda and white tipped sharks are a common sight while diving in Sipadan. The city center is quite small, and you can walk from one end to the other in less than 30 min. Short fares are around RM10, longer trips around RM20. A whole day shouldn't cost more then RM300. Towering 13,431 feet above the verdant tropical jungles, Mount Kinabalu is the magnificent centerpiece of Kinabalu Park and one of the highest mountains in Southeast Asia. Haggling is absolutely vital in order to get a fair price. Many taxi drivers in Malaysia are infamous for raising their fare prices, even after a price has already been determined by thorough prior negotiation. They frequently attempt to manipulate and deceive unknowing tourists by feigning ignorance and delivering tourists to the wrong hotels, which sometimes provide kickbacks to the drivers. Mentioning a call to the authorities may resolve the situation quickly. Monsopiad Cultural Village : founded in memory of the great Kadazan warrior and headhunter Monsopiad Located about half an hour south-east of town, this small park shows the traditional way of life of the Kadazan ethnic group and tells the story of Monsopiad, a Kadazan warrior who lived some 300 years ago and who killed 42 men who attacked his village. The 42 skulls can be viewed in the Hall of Skulls. Entrance fee is RM50 for adults, RM10 for children (prices for non-Malaysians). 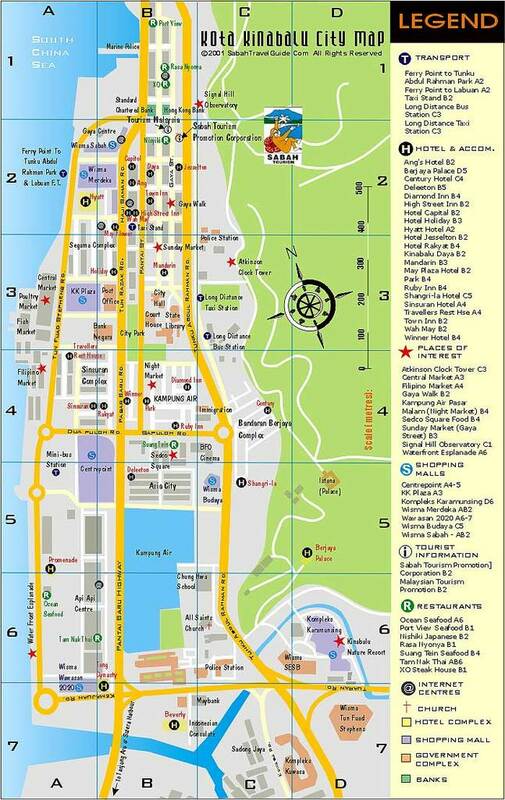 To get there you can hire a taxi from Kota Kinabalu and arrange to be picked up some hours later. The rate should be around RM80, or RM20 one-way. Tunku Abdul Rahman Park : a cluster of five islands, about 20 minutes speed boat ride from the city. Boats depart from Jesselton Point Ferry Terminal or possibly use one of the dive operators boats if going there on a dive trip from Kota Kinabalu. Kota Kinabalu Handicraft Market (Next to the waterfront). It is a very colorful place that will stay in your memory as a 'souvenir' from Sabah.